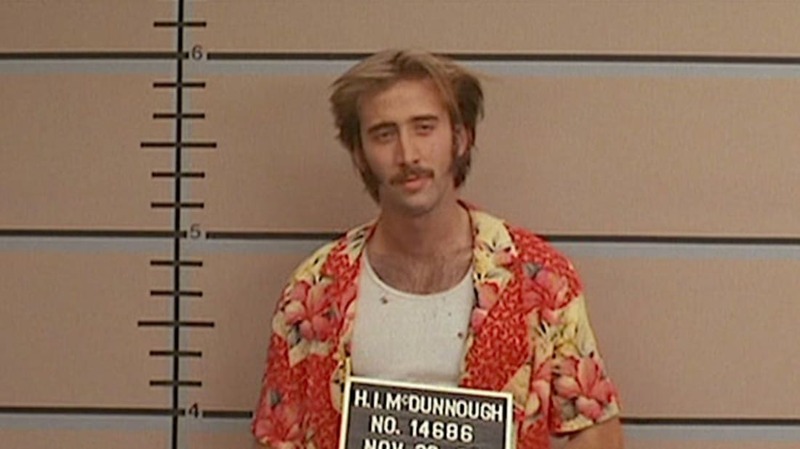 Raising Arizona is a well-regarded early Coen brothers comedy that stars Nicolas Cage as H.I. McDunnough, an ex-con who can't shake his inclinations to steal, even after getting together with ex-cop Ed(wina), played by Holly Hunter. When it's discovered Ed cannot have children, the two steal a single quintuplet from Nathan Arizona, a successful furniture store owner. Here are some facts about the movie to read before you get in dutch with the wife. 1. THE COENS WANTED TO SHOOT THE HUDSUCKER PROXY BEFORE RAISING ARIZONA. After the success of Blood Simple (1984), Joel and Ethan Coen planned for The Hudsucker Proxy to be their next film. Because the budget for that movie ($40 million) wouldn't work for their producers at Circle Films, they wrote Raising Arizona instead. They wrote the script in four months and reportedly shot it for $2 million. Look closely and you'll see a nod to The Hudsucker Proxy in Raising Arizona: the logo on H.I. 's work uniform reveals that he works for Hudsucker Industries. 2. THE STORY WAS INFLUENCED BY WILLIAM FAULKNER AND FLANNERY O'CONNOR. 3. KEVIN COSTNER AND RICHARD JENKINS AUDITIONED FOR THE FILM. Kevin Costner auditioned three times to play H.I., only to see Nicolas Cage snag the role. Richard Jenkins had his first of many auditions for the Coens for Raising Arizona. He also (unsuccessfully) auditioned for Miller's Crossing (1990) and Fargo (1996) before calling it quits with the Coens. In 2001, Joel and Ethan cast Jenkins in The Man Who Wasn't There, even though he had never auditioned for it. 4. KATE CAPSHAW TURNED DOWN THE LEAD. Kate Capshaw said no to playing Ed in Raising Arizona—and later regretted the decision. She also notably turned down the role of Diane Chambers on Cheers. 5. THE COENS WANTED TO MAKE A COMEDY TO CONTRAST BLOOD SIMPLE. "Essentially, after finishing Blood Simple, we wanted to make something completely different," Ethan explained. "We didn't know what, but we wanted it to be funny, with a quicker rhythm. We also wanted to employ Holly Hunter, a long-standing friend." Hunter (who lent her voice, uncredited, to Blood Simple) took on the role of Ed. 6. A LOT OF BABIES WERE FIRED FROM THE FILM. The infants were canned for taking their first steps when they were supposed to crawl. One mother went so far as to put her baby's shoes on backwards in order to prevent him from walking. Eight-month-old T.J. Kuhn won the role of Nathan Junior. 7. NICOLAS CAGE'S HAIR REACTED TO H.I. 'S STRESS LEVEL. Ethan claimed that Cage was "crazy about his Woody Woodpecker haircut. The more difficulties his character got in, the bigger the wave in his hair got. There was a strange connection between the character and his hair." 8. CAGE TOLD A FAN SHE WAS GOING TO DIE. As Sam McMurray (who played Glen) remembers it, one day during production he and Cage went out to eat at Denny's, "or one of these places," and an excited female fan came over to their table. She couldn't decide if the man she was looking at was really Cage. Once convinced it was him, she asked him for an autograph. "She had like a wet cocktail napkin," McMurray recalled, "and he wrote, 'Tomorrow you will die. Nic Cage.' And I thought it was hysterical." 9. THE FILMMAKERS GOT EXPERIMENTAL WITH THEIR CAMERA TECHNIQUES. Wanting to have as many options as possible in the editing room, the Coens and their cinematographer, Barry Sonnenfeld, decided at one point to have Cage run through the house while holding a camera towards himself. After seeing the results, they was decided it was too weird. 10. THE MAYOR OF SCOTTSDALE WAS NOT HAPPY WITH THE MOVIE. Mayor Herb Drinkwater proclaimed that the film had "no redeeming social value" and that it "certainly isn't the image Arizona wants to project." The low-budget movie made over $29.1 million worldwide.